Yakutian horse (also known as the Yakut horse, Yakut pony, or simply the Yakut) are a rare native horse from the Siberian Sakha Republic (or Yakutia) region. They impressive om their adaptation to the extreme cold climate of Yakutia, including the ability to locate and graze on vegetation that is under deep snow cover, and to survive without shelter in temperatures that reach -70 °C (-94 °F). Yakutian horse appear to have evolved from domesticated horses brought with the Yakuts when they migrated to the area beginning in the 13th century, and are not descended from wild horses known to inhabit the area in Neolithic times. 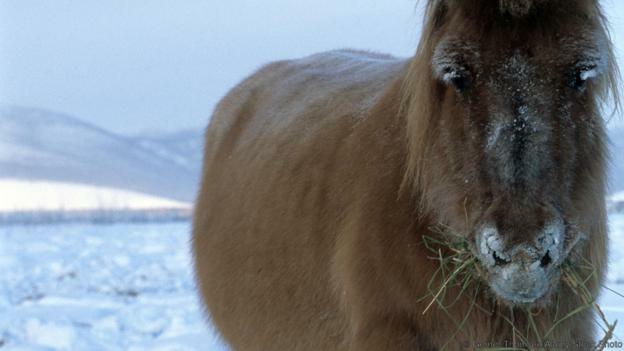 They are small, averaging 150 centimetres (14.3 hands) and shares some outward characteristics with the Shetland pony, including sturdy stature, thick mane, and heavy hair coat. There are several subtypes of Yakutian horses. The Northern type is the purest bred Yakut, and is sometimes called the Middle Kolyma or Verkhoyansk horse. They are usually bay, gray, or light dun colored, with primitive markings including a dark dorsal stripe and zebra-pattern stripes on the legs - this variety is considered to be the most valuable. The second variety is the Smaller Southern type, which is also considered a pure but less valuable breed. The third variety is the Larger Southern type, which is the result of cross-breeding with other breeds, and is widespread in central Yakutia.